3. Click on the “ Get Cashback“ button and it’ll take you to Walmart. If you are on mobile you’ll need to scroll down and click “ View Desktop Site“ or you won't see the button. 4. Add 1 “Kubo and the Two Strings DVD" priced for $9.99 to your cart and checkout. Do not add anything else to your cart. If the price changes or anything happens to the stock, the deal is officially over. 6. Once you checkout, in about 14 days $9.99 will post in your TopCashback account. 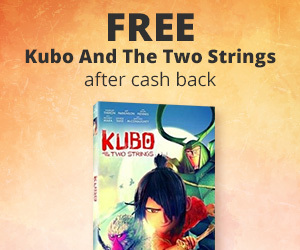 Get your free Kubo And The Two Strings DVD from Walmart today!